Happy Monday, I hope everyone had an amazing weekend. The weather this weekend was little wacky. It was cold out on Saturday in the 50’s. My weekend was pretty low-key. I didn’t do much. We had a lot of high school proms in the area as the end of the school year starting to wrap up, it’s really bitter sweet. Of course we also had the basketball playoffs, which were very interesting to say the least. But overall I didn’t do too much, the weather was perfect on Sunday it rained a little which is perfect for my vegetable garden. Was thankful that it actually warmed up to high 70’s. Also, I was able to actually plant some of my vegetable plants that I purchased from the nursery a couple weeks ago. Let’s not forget about the royal wedding. I was up early Saturday morning watching it and I really enjoyed every minute of it. 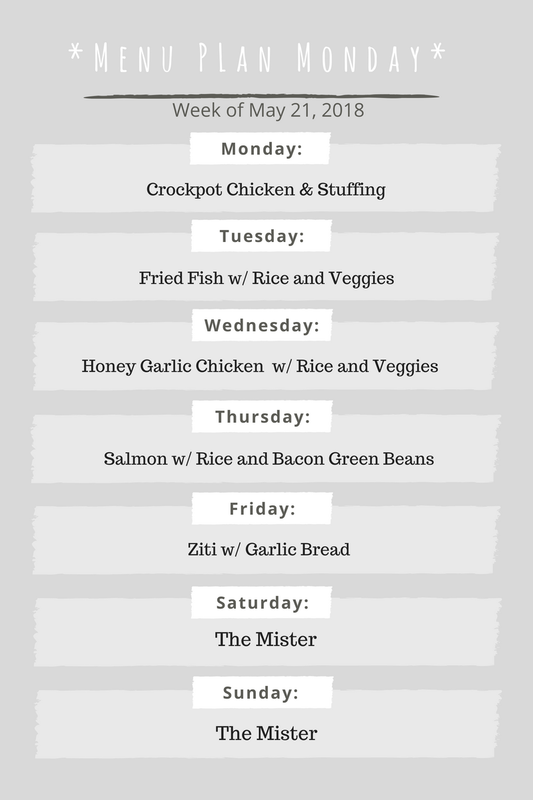 Sounds like a great lineup of meals you have coming up this week. That honey garlic chicken sounds so good. I always enjoy seeing what your planning for each week. Give me ideas and inspiration for what we may have during the week. I really need to get my act together and do some more meal planning. Going to take a few cues from you! Our weather was crazy too. It was hot on Saturday and then rain came in on Sunday, so it cooled off. We were actually at the pool when the rain came in. I think I have an idea of what I'm making for dinner this week. I watched the Royal Wedding! Thankfully I just happen to wake up at 645am EST to catch it right at the beginning! You've also reminded me I need to plan this weeks meals haha! I like that you've added The Mister to the weekend! Smart! your menu sounds delicious. 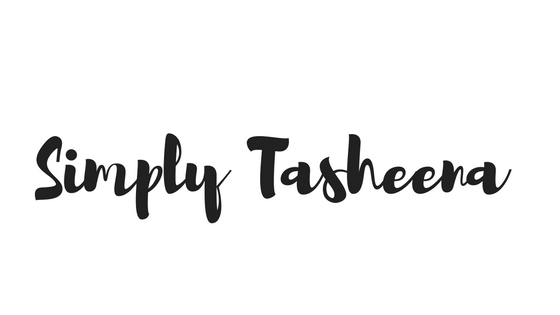 My week is always much smoother when I plan my meals, but lately we've had so much going on I haven't and I run to the store every day for food for dinner. My goal is to plan two weeks in advance. meal planning can save lots of time and money. Crockpot Chicken sounds tasty, and ziti is always a good thing. Sounds like you had a pretty chill weekend. I enjoyed watching the royal wedding as well. The menu for the week is looking good! Love the menu this week! The variety is exactly what I am looking for. My dinners tends to be the same meals! We literally just started to consider meal planning or neal prepping. It seemed tesious but my goodness you make it sounds so easy! I love your week worth food line up. It sounds like you had a nice low key weekend, I think meal planning is such a good idea but I have to admit I'm not sure I would ever manage to stick to one. Sounds like it was a relaxing weekend. Hope you have a great week. Thank you for the meal inspiration! So organized! The menu looks amazing! I love fish and veggies, I can have them everyday! I've tried menu plan for a week and I fail. I always end up cooking what my children or husband crave for the day. I was definitely glued to my sofa watching everything that's related to the Royal Wedding. I'm so fascinated with Harry and Meghan. Love seeing them together! Sounds like you're having a delicious set of meals planned for the week :) This weekend was pretty low-key for us. 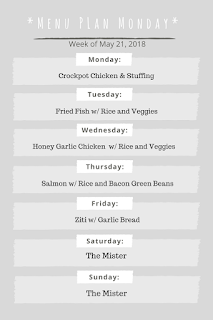 I need to start making a weekly menu. This is a great way to stay organized. I like this weeks menu. You got me excited to make my own now!